So here we are – April 15th already. How did your tax day go? Of course, no one likes to pay taxes – so I'm not asking how you liked tax day. Rather I want to know how organized and in control you felt over your paperwork. Because I always try to look for the silver lining – I like to use tax time as a way to put my financial house in order – which is exactly what I have been doing this past week. Are you organized enough if something bad happens to you? Here are some ways you can turn April 15th to your advantage. By “the past year” I am talking about the year of the tax return that was due today (which would be last year's return). If you don't already have a tax folder set one up now. This folder should work either with your current filing system or with the way you think. My tax file of choice at this time is a three ring binder. I also like to put an empty three ring binder pocket (if you are using a three ring binder) in the front of my binder. This serves as a catch all for receipts and things that I need to process. The important thing is that you actually take the time to process the things you place here on a regular basis. Print your completed tax returns and place them in the section of your tax folder that is designated for tax returns. Only do this if you have a safe and secure place to store your tax folder. Remember that your tax returns contain private information like social security numbers and income numbers. If you haven't already, file all of your tax documents behind the appropriate tabs. Now put your completed tax file away so it's ready for you to pull out next year to refer to at tax time. By current tax year – I mean the year that is happening right now as you read this article. I know, the year isn't over yet. But if you set your tax file up right now – you can use it to collect all those important pieces of paper that come in throughout the year. If you make a charitable donation today – even if you do it online – you can print out and store the receipt behind the Deductions tab in your current year tax file. If you make a tax payment – same thing. Print out, collect, and store all of the information that relates to taxes right in this folder. When April 15th rolls around again next year – your work load will be so much lighter because you are putting things together all year long. Now that your taxes are done for last year, it should be clear to you whether you are having enough taxes withheld from your paycheck or paying enough estimated tax. if you are getting a refund, then you may have withheld too much depending on the size of the refund. always remember that if your income situation has changed or changes then your tax situation will also change. Tax time is actually a great time to take stock of the bank and credit card accounts that you have open. Consolidating several accounts down into just a few can make managing your finances a lot easier. Consider closing accounts that you don't use or taking the time to find lower interest rate credit cards if you carry a balance. Tax time is also a good time to put together a household budget – especially if you are getting a refund. Don't let that refund disappear. Put it away and make a plan for how to use it. If you used an accountant to do your taxes, were you happy with the service? Maybe you didn't use an accountant but feel that you should have. Rushing around at the last minute looking for a good accountant is not a good idea. But, right now you have a whole year to find just the right person. Start asking around for recommendations so you have things lined up and ready to go. Using a program like Quickbooks Self Employed or FreshBooks can help you to keep your business finances in order. Keep your finances up to date throughout the year so you don't have to scramble when the returns are due. 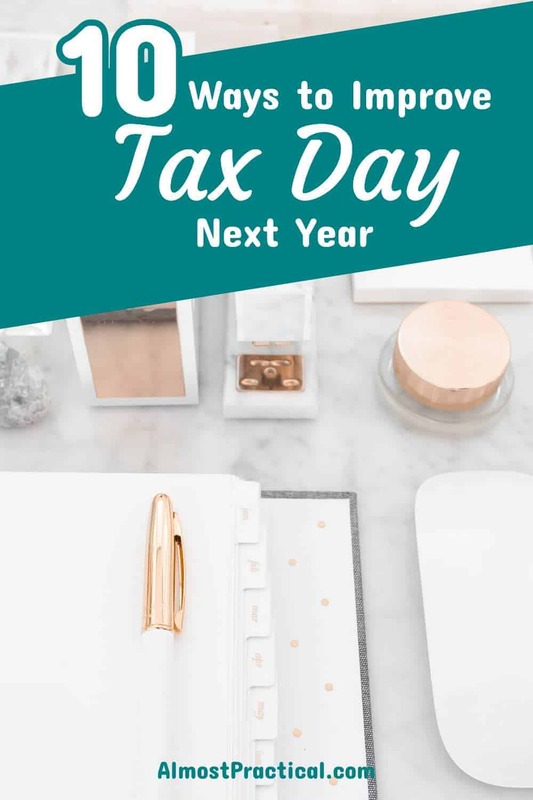 If you start planning for next April 15th right now – you can take a lot of the stress out of tax time. « The Genius Blogger’s Toolkit Flash Sale Is Now!